Rammed earth dates back thousands of years. Many European castles and the Great Wall of China were built using this technology. As the name implies, rammed earth construction involves the use of compressed earth. A mixture of earth consisting of the right amount of sand, gravel and clay is poured into a mould or formwork. This earth mixture is rammed until it becomes rock solid. When properly constructed, rammed earth walls can resist the various onslaughts of nature for a very long time. The ideal soil mixture for rammed earth consists of clay, sand and gravel up to a size of 3cm. Sand and gravel provide the structural strength whereas clay is the glue which holds the mixture together. It is easy to understand if we compare it with the human body where the bones keep us straight and upright and all ligaments, tissues and muscles connect the bones and keep them in place. Cement replaced the function of the clay as the glue in modern age. Almost every soil is suitable for rammed earth. The aim is to use local soil for the mixture. There is no existing fixed formula for the mixture since soil differs from one place to another. Every type of soil has to be analyzed, and sand and gravel added according to its clay content. Besides this earth building technique, there are other common methods like adobe (earth bricks), wattle and daub (wood or bamboo grids plastered with earth), and cob (a mixture of earth, straw or any natural fiber, and sand). Each location or project requires its own technique. In other words, there is an ideal earth technique for every situation. Rammed earth has the highest density of all earth-building techniques and has the highest compression strength. This means that it is the most suitable method for load bearing purposes. 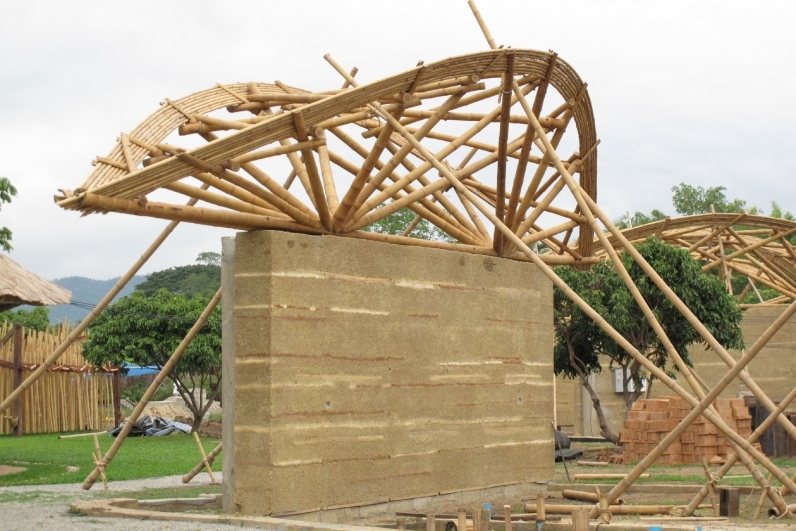 In the case of the buildings CLC constructed at Panyaden School, the rammed earth walls carry the bamboo roof structure. How To Build A Rammed Earth Wall? To create these walls, a mould is needed which helps to define the shape of the wall. We use straight bamboo panels that give us smooth and straight walls. Even though it is not necessary, some constructors prefer to stabilize the mixture with cement. Traditional stabilizers may include animal blood (something CLC does not use) and limestone. Prior to the compaction, the mould is filled with slightly moist soil up to a layer height of between 8cm to 15cm. To compact the soil, we traditionally use a stamper that consists of a heavy foot (between 3kg – 8kg of steel, wood or stone) and a handle. By continuously lifting the stamper and letting it hit the soil, a compaction of up to 50% is the desired result. The moment the top of the mould is reached, the mould can be removed and set again on top of the created wall to go higher, or on the side to elongate the wall horizontally. Rammed earth, like other earth techniques, has a golden rule which says “In order to guarantee a long life, an earth wall needs good boots and a good hat”! This means that a water barrier towards the ground has to be provided as well as a roof above the wall in order to keep the horizontal top of the wall dry. A big part of the Great Wall of China is built out of rammed earth and this was 2500 years ago! The walls are still intact. The Alhambra in Granada was built 700 years ago and is still standing. Rammed earth lasts for thousands of years if the important points during construction are thought through carefully which is exactly what CLC did for the Panyaden School project.